There is quite a bit on this board about storing gas, usually in the portable red containers. I’d like to add my .02 to the discussion. Over the past few years the technology of gas cans seems to have become more and more complicated, what with the rickety triggers and valves on nozzles which (I’ll guess) look like they had been designed by a committee of bureaucrats who had absolutely no idea of the purpose or application of a gas can other than vaguely as a nefarious tool of global warming. The spouts are complicated and so cheaply made they never seem to work even if you follow their logic. And they seem to require three hands to operate. Plus the venting is bad. Bottom line: I wind up spilling more gas with the new ones than the old – what a waste. The law of unintended consequences at work, I guess. From my point of view a gas can should safely hold gas, which the user can then safely pour into whatever tank it needs to be in, without wastage. IMO that’s caring for the environment: everyone involved and the planet earth survives without contamination. 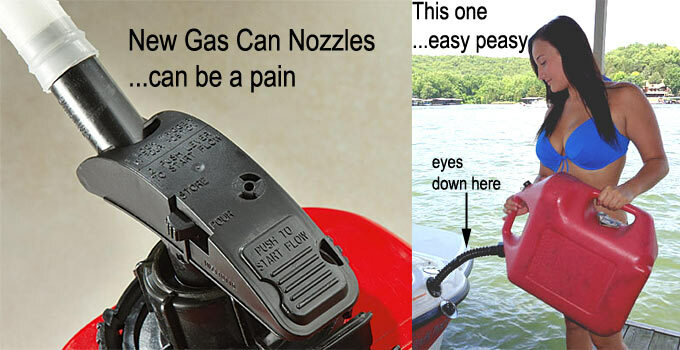 First, is to find and use older gas cans. The ones with the uncomplicated spouts and a separate air hole to vent the tank as the gas glugs out so it doesn’t massively take a breath and spurt gas all over the place as you pour. I find them at yard sales and thrift stores, usually around $1-$3 each. Sometimes, neighbors set out old ones along with the trash on the curb, which can be recycled. IMO this is the best option. Second, if used is not an option, you can replace the nozzles and the air vents. The nozzles just screw on. For the vent caps you need a suitable size spade lug on your drill to make a hole to snap the vent into. Both work great. End result? Gas flows better and the world is a better place. [ Ken adds: Tip regarding vent cap: You will have to drill a 31/64″ (one size below 1/2″) hole into the can ( e.g this bit ), then push the vent into the hole. Obviously empty gas can first. After drilling, be sure to remove drilled debris which may have accumulated. [ Ken adds: ] I have converted ALL of my ‘new style’ gas cans (actually plastic jugs) with the modifications linked above. I did this several years ago and what a difference! I’ve only had to replace one spout since then (o-ring seal got pinched). WHAT TIPS AND TRICKS DO YOU HAVE TO SHARE ABOUT GAS TANKS?